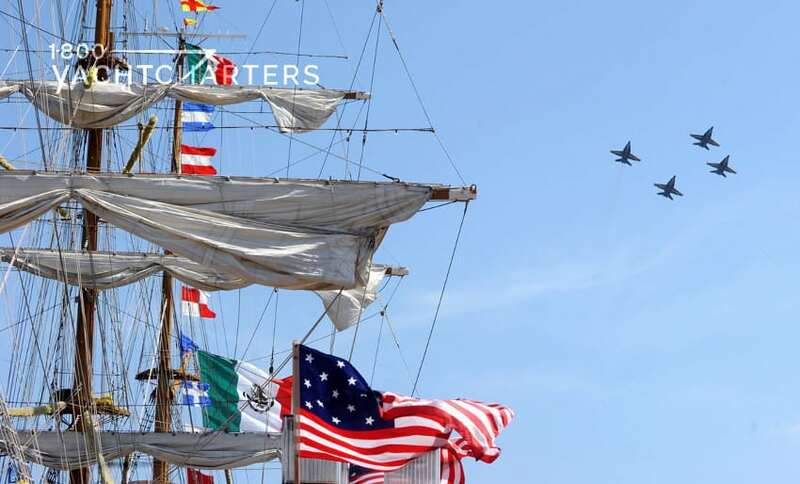 Posts tagged "New England yacht charters"
An international parade of more than 40 tall ships and naval vessels unite. They kick off this summer’s highly-anticipated New England yacht charter season. It is dubbed the Star-Spangled Sailabration. Happening June 13-19, the ships will sail into Baltimore. They do this for the national launch of the Bicentennial of the War of 1812. It also includes celebration of the writing of the Star-Spangled Banner. The Star-Spangled Sailabration features free tours of ships and other things. For instance, waterside festivities, an air show featuring the Navy’s Blue Angels, and world-premiere of the “Overture for 2012.” The song is composed by Philip Glass. 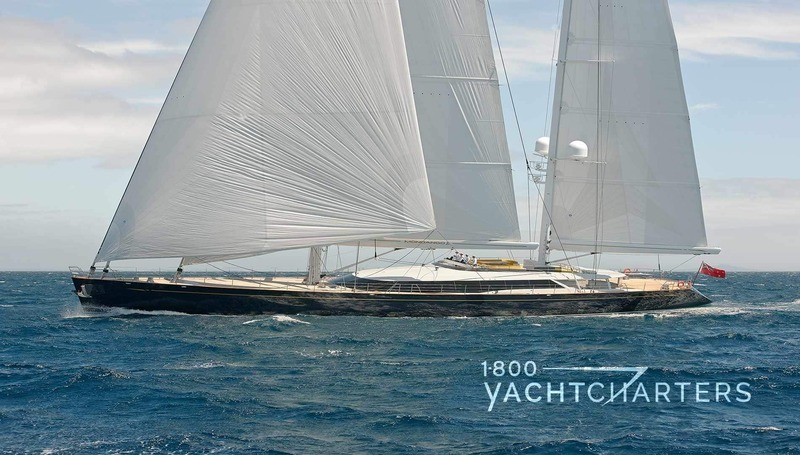 Each summer, the number one global destination for luxury sailing charter yachts is New England. Many private charteryachts are in the Baltimore area for the Star-Spangled Sailabration, also. This is before they move on to their bases of operation. They venture to locations such as Newport Rhode Island, Boston Massachusetts, and the Hamptons. 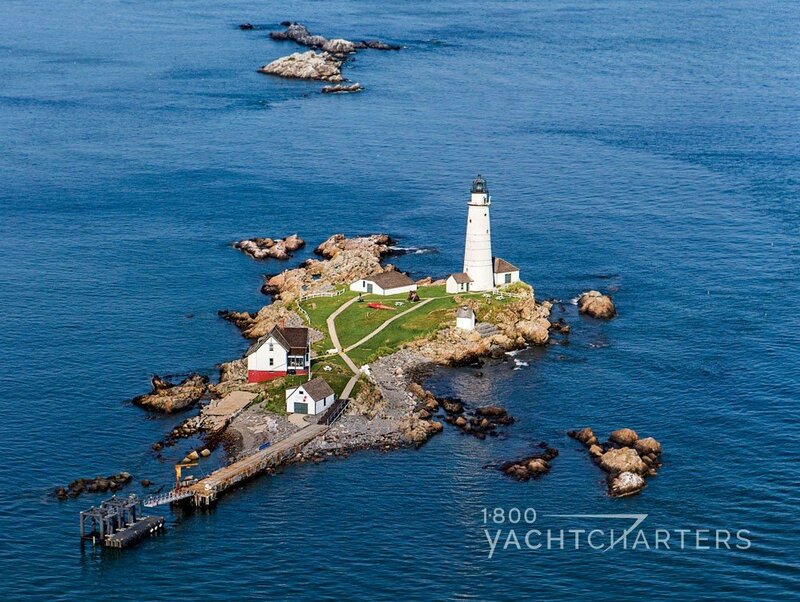 To book your New England yacht charter with 1-800 Yacht Charters, CLICK HERE. Boston, Massachusetts – bet you didn’t know there are 34 islands off of Boston that are open for exploring? Yep, Beantown is a great stopover for anyone planning a New England yacht charter vacation. The Boston Harbor Shipyard and Marina is world-class and a great place for megayachts to dock. If you have kids in your group, take them to the Boston Children’s Museum (kids love this place – lots of interactive exhibits). Adults will enjoy cocktails at ultra-upscale Strega Waterfront’s dockside bar, overlooking Boston Harbor on Fan Pier in the beautiful Seaport district (try the Silviano, made with Stoli and muddled blueberries – but make sure a crewmember drives your tender back to your yacht). Bute Inlet, British Columbia – sure, just about any island or inlet north of Seattle is mesmerizing, but we like the isolation of this rugged fjord on the Canadian side of the border. This place is all about mountains, wilderness and nature. Take note- this is not a destination for small boats. Strong winds can swirl down from the mountains into the inlet. Large yachts with stabilizers (think expedition yacht charter destination) are a must in our opinion. Putting up with the wind is well worth the natural beauty of this locale. Cuba – don’t even to try to say, “Been there, done that” ‘cause we know you’re probably fibbing! A decades-old embargo between the USA and Cuban governments virtually shut off this island destination from the yacht charter marketplace. The proud, resilient Cuban people are eager to meet North Americans and share their beautiful country, artwork, and crafts. As travel regulations continue to loosen up, we anticipate that more and more charterers will want to be among the first yachtsmen and women to explore the many bays and protected anchorages this island nation offers. It’s important to note a well-stocked and provisioned megayacht is essential – the island’s marine infrastructure is nonexistent, and the country’s economy, quite sadly, is a trainwreck. 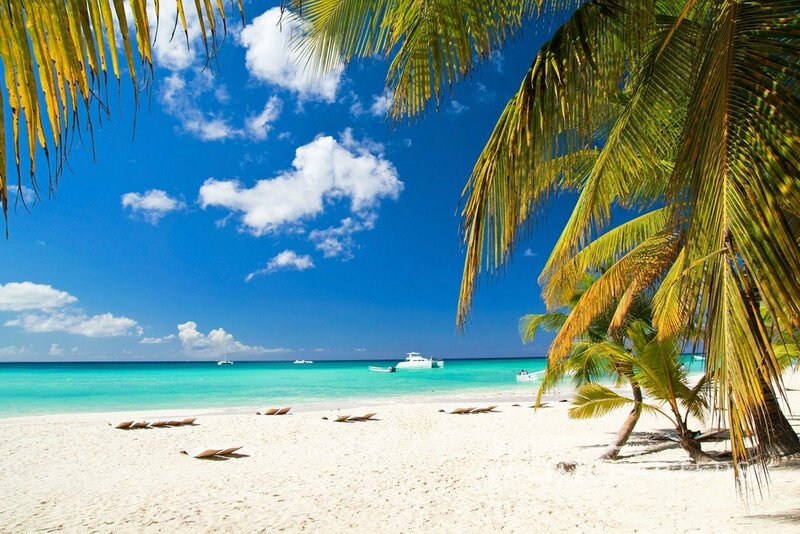 What’s your favorite hidden gem dream yacht charter destination for a vacation in the western hemisphere? Share your favorite spot with us in the comment section below, and we’ll send you a complimentary eco–friendly tote bag – courtesy of 1-800 Yacht Charters. Email your contact information to us at info@1800yachtcharters.com for your tote bag! YACHT CHARTER | Last-Minute Luxury Yacht Savings! The summer is heating up and so are the special discounted rates available throughout the 1-800 Yacht Charters global charter fleet. Whatever your destination and desire – from spending sunny days exploring St. Tropez and the French Riviera; enjoying lobster bakes in traditional New England fashion; or enjoying water sports in the beautiful Bahamas, it’s not too late to book your dream holiday! The Western Mediterranean is renowned as a summer playground for yacht enthusiasts, and the heart of the Côte d’Azur remains the tiny principality of Monaco. From here, famous ports like Portofino, Cannes, and St Tropez are within a few hours by yacht. From its Michelin-star restaurants, hot clubs, and haute couture to the natural beauty of stunning coastlines and pristine beaches, the Western Mediterranean offers so much to explore. The 139-foot (43 meter) CRN luxury motor yacht HANA is discounted to €120,000 per week in June (regular rate €135,000 per week). Yacht HANA offers spacious decks, including a sundeck with Jacuzzi spa, plasma screen TV, barbecue, and more [maximum 11 guests]. The turquoise waters of the Adriatic are the perfect backdrop for a private yacht charter holiday in the Eastern Mediterranean. From the stunning scenery of Montenegro to the vibrant culture of Greece, you’ll be spoiled for choices when deciding on an itinerary. The Adriatic can be your playground this June if you book a week on board the 147-foot (45 meter) Viudes Yachts motor yacht PRIDE at the special rate of €130,000 per week (regular rate €160,000 per week). Launched in 2013, PRIDE offers impressive interior volume and vast decks for alfresco living. Living in North America and thinking about staying a bit closer to home this summer? We’ve got you covered! Warm, salty breezes and beautiful sunny days are on the agenda during your New England summer escape. Cruise from the bustling metropolis of Boston, to the luxury haven of the Hamptons, to the natural sanctuary of Maine. For a more traditional itinerary, kick off your adventure in Newport, Rhode Island and explore Martha’s Vineyard and the tiny fishing villages near Nantucket and Cape Cod. OK, you want to stay close to the USA, but you want to feel the vibe of an island escape. For you, the best destination is the Bahamas – home to beautiful islands, atolls and cays, and some of the clearest ocean waters on earth. Less than 1 hour by plane from South Florida, the islands of the Bahamas are not only easily accessible, but they also offer a unique and laid back island vibe, perfectly suited for a summer holiday. If you hurry and book by July 31, you can experience the Bahamas onboard the 164-foot (49.99 meter) Trinity superyacht AMARULA SUN and save 15% (regular rate $230,000 per week, now on special for $195,000 per week). This impressive superyacht offers five-star service and deluxe amenities – including a large swim platform, a sundeck with open-air Jacuzzi, a baby grand concert piano, and a cozy fireplace in the skylounge. Looking for a more intimate yacht? Book a week in the Bahamas onboard the 123-foot (37.49 meter) motor yacht TEMPTATION and enjoy a special rate of $60,000 per week through August 31 (regular rate $70,000 per week). Built by Palmer Johnson in 2005 and refit in 2015, she offers a fully-stocked toy chest, including 36-foot center console Yellowfin tender, a 15-foot wide-body Novurania RIB, two deluxe wave runners, paddleboards, wakeboard, water skis for children, and many more toys. For more information on these sizzling summer deals, call 305-720-7245, email info@1800yachtcharters.com, or use our convenient online inquiry form here. It’s time to plan your 2-week summer vacation. You want to head down to the sunshine state and cruise along the coast, but your spouse just heard Barry Manilow’s “Weekend in New England” on the radio. Now, the talk turns to a New England yacht charter. Which destination do you pick? That’s easy – pick BOTH and enjoy a 50% discount to boot!!! 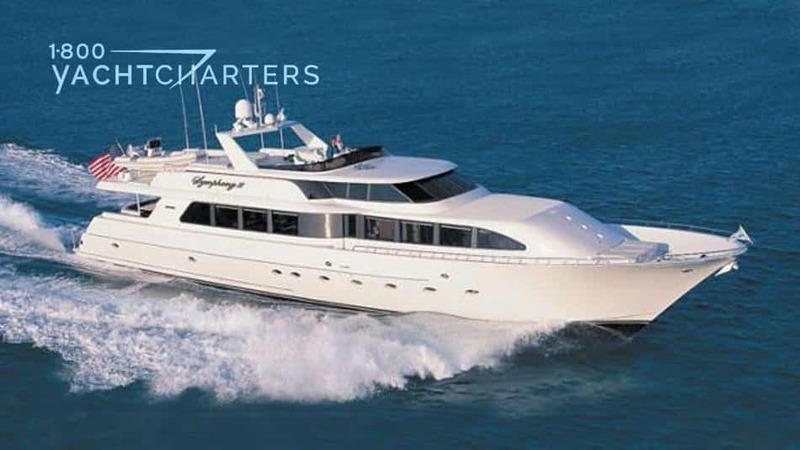 The 112′ Westport motor yacht SYMPHONY II will be transiting from South Florida to Newport, RI this summer and is offering a 50% discount for any northbound charters after August 1, 2011. 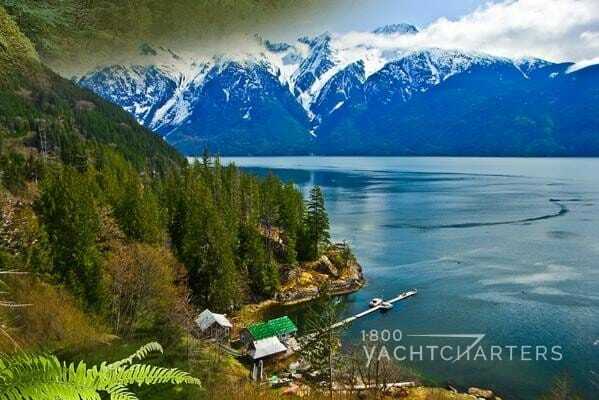 Travel from Key West, Florida to Canada by yacht as transportation. 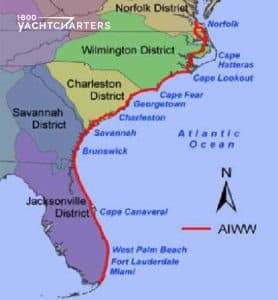 The Atlantic Intracoastal Waterway (often called the ICW) is a “highway” for yachts. Avoid the rough seas of the open ocean, and travel this system of rivers. It also includes protected coastal waters on the East Coast. Cruising the ICW offers charterers a chance to explore ports of call in Florida, Georgia, the Carolinas, Virginia, Maryland, Delaware, New Jersey, Connecticut, and Rhode Island. There are plenty of wonderful stops along the way which will enable you to sample the different cuisine and experience the beautiful scenery of the U.S. Atlantic coast. Lovely 112 foot Westport yacht SYMPHONY II is the epitome of elegance and comfort. For instance, four spacious staterooms all featuring ensuite facilities make her amazing. 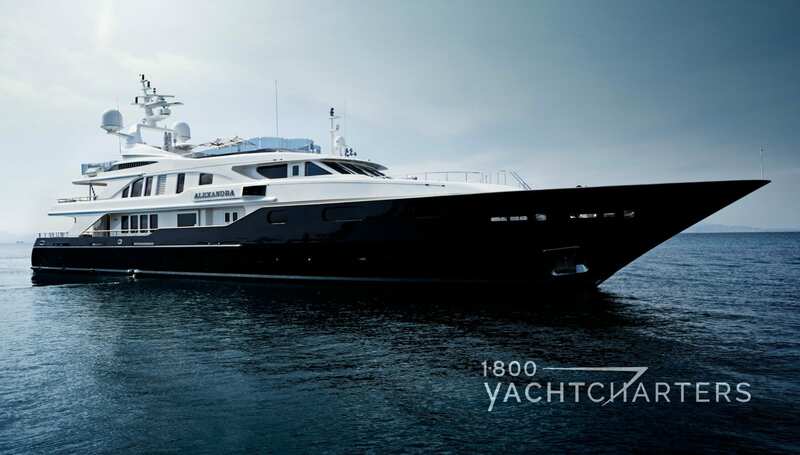 She accommodates eight guests and offers a wide variety of amenities found only on larger yachts. The regular weekly charter rate is $49,500 plus expenses. All northbound charters along the ICW after August 1 are priced at $24,750 per week plus expenses – a whopping savings of 50%!